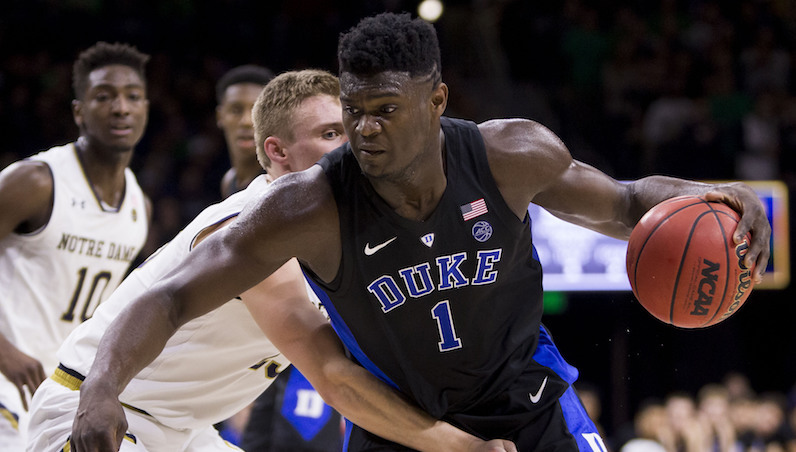 You can make the case that on the road Monday night against Notre Dame was the best game Zion Williamson has played at Duke. In terms of offensive rating, the 172 Williamson slapped up was his best of the season — topping the Kentucky performance. Up in South Bend, Williamson went for 26 points (10-of-12 FGA, 9 FTA), nine rebounds (four offensive), four assists, four blocks and a steal. This marks the fifth straight game Zion has shot 60+ percent from the field, scored 22+ points and recorded at least one block and one steal. Somehow, that only tells part of the story, too. Williamson puts together these types of performances twice a week now, it seems; they almost start to run together. The guy just keeps getting better. Before this Saturday’s marquee matchup with St. John’s, let’s circle back to some of the wicked stuff Williamson pulled out against the Irish. For the season, Williamson has collected 39 blocks (2.8 per 40 minutes) and 39 steals (2.8 per 40 minutes). When it comes to blocks and steals (78 STOCKS), Williamson and Matisse Thybulle of Washington are in category all to themselves. They are the only two players in the country with 35+ steals and 35+ blocks. There’s a very good chance that after the St. John’s game that Williamson will eclipse the 40 benchmark in both of those statistics. He already has 42 dunks (second most in the ACC) on the season, too, which goes along with 45 turnovers (14.9 percent turnover rate). It’s pretty wild that he has nearly as many dunks, steals and blocks as he does turnovers, especially when you factor in his high usage (28.6 percent usage rate). Plus, his rim protection is just amazing. Williamson gets away with a goaltend on this play, but he’s now blocked 6.5 percent of opponent two-point field goal attempts while on the floor this season — No. 107 in the nation, per KenPom. Williamson has now played 20 games for Duke; in 18 of those contests, he’s blocked at least one shot. On 10 different occasions — half of Duke’s games — Zion has blocked two or more shots. Look at this exchange from Tre Jones and Williamson — two elite defenders. Duke switched 1-5 again last night. On this ball screen, Jones and Javin DeLaurier switch, which puts Jones on a rolling John Mooney. Jones, a super smart player, knows this is a mismatch and calls for Williamson to switch behind the play. The recognition is instantaneous; Williamson closes the space down in a blink and gets up for the denial. Williamson continues to flash an amazing combination of speed, agility and coordination. In transition, he has the ability to go from a full speed dribble to stopping on a dime and finishing with grace or power at the rim. From the half court, he continues to flash that amazingly graceful spin move that constantly creates separation and opens an angle at the rim. According to Synergy, Williamson has scored 1.51 points per possession (73.7 FG%) on half-court attempts at the rim. He’s one of three players scoring over 1.5 points per possession and shooting above 70 percent on these types of looks. (Zion is joined in this category by Gonzaga high-riser Brandon Clarke: 1.52 points per possession, 72.5 FG%). It’s jarring how quickly Williamson can move from a standstill position. One second he’s ground-bound, the next he’s soaring through the air, dropping two points and another highlight on your head. Williamson has scored 1.19 points per possession (71.4 FG%) on post-ups this season, which ranks 11th nationally (minimum 30 possessions). When he posts on the right block, Williamson goes to his left the majority of the time; in a limited sample, he’s shooting 80 percent on said possession types. After Monday’s game, Zion has scored now 439 points (22 per game, 31 per 40 minutes) on just 251 field goals this season. He’s shooting over 75 percent on 2-point field goal attempts, and is one of only two players with a usage rate over 25 percent and effective shooting rate over 65 percent (70.3 eFG%).